Just a day after celebrations globally of Indian Independence, members of Houston’s swelling Indian population gathered to mark the hub of their community with a monument of Mahatma Gandhi.A marble edifice bearing a bronze engraving of Gandhi’s face was unveiled at the entrance of so-called Little India, an area off Hillcroft Avenue near Highway 59. “This is a fitting monument,” said Harish Parvathaneni, the counsel general of India based in Houston, as an orange velvet curtains adorned with strings of flowers fell away to reveal the art. Many women in the crown wore brightly colored shalwar kameez, traditional South Asian garments, and waved mini Indian flags, while the men wore stoles with the country’s colors around their necks. The Mahatma Gandhi District, as it was formally named in 2011, serves as home to dozens of Indian restaurants, grocery stores, jewelry stores and other businesses, representing decades-long efforts of the thriving Indian community. “In 1968, there were barely half a dozen families of India that had made this their home,” said Virendra Mathur, trustee and co-founder of India House, a local community center. Since then, the city’s Indian population has grown “exponentially,” he added. Community leaders now estimate that about 125,000 people of Indian descent live in the Houston area, with the southwest Houston neighborhood serving as an enclave. Many immigrants were initially attracted to Houston because its sweltering climate is similar to India’s, and for Houston’s affordable housing and strong job market, said Vijay Pallod, trustee for the India Culture Center. Now, they also come for a strong cultural community that offers numerous staples and comforts from home, including 22 Hindu temples. After 11 a.m. on any given Sunday, community members know finding parking at any of the area’s shops and restaurants will be nearly impossible. People flood the area to shop at popular local grocery store Patel Brothers or eat at Shri Balaji Bhavan, a counter-service establishment with authentic vegetarian Indian fare. “You have everything here, what you need,” Pallod said. Getting the monument there, however, was not easy. 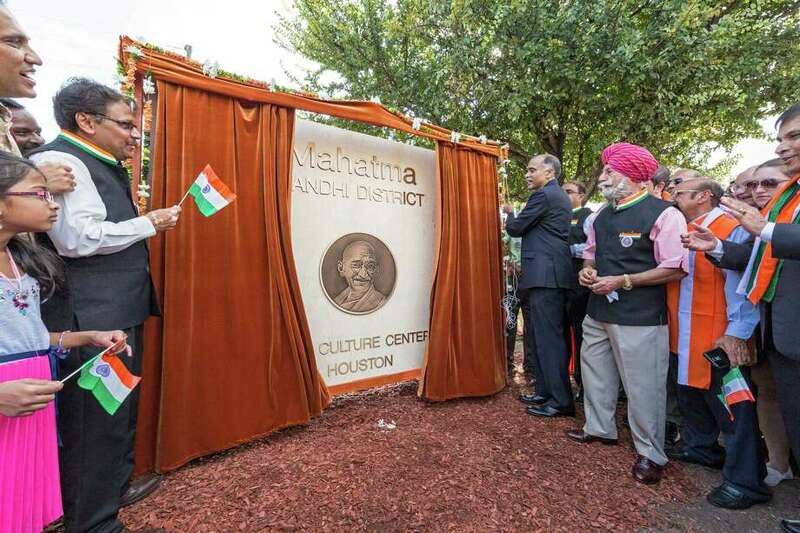 Local Indian community organizations and businesses raised $25,000 to construct the monument and worked closely with city officials, said Col. Raj Bhalla, the former president of Houston’s India Culture Center who helped lead fundraising efforts. The first sketch that arrived in July didn’t look much like Gandhi, so organizers said they had to scramble have it redesigned. The finished monument did not arrive in Houston until Aug. 12, four days before its scheduled installation. Several public officials attended the unveiling, including U.S. Rep. Al Green, D-Houston, state Rep. Gene Wu, D-Houston, and Houston City Council member Mike Laster, as well as council members from Sugar Land and Stafford.